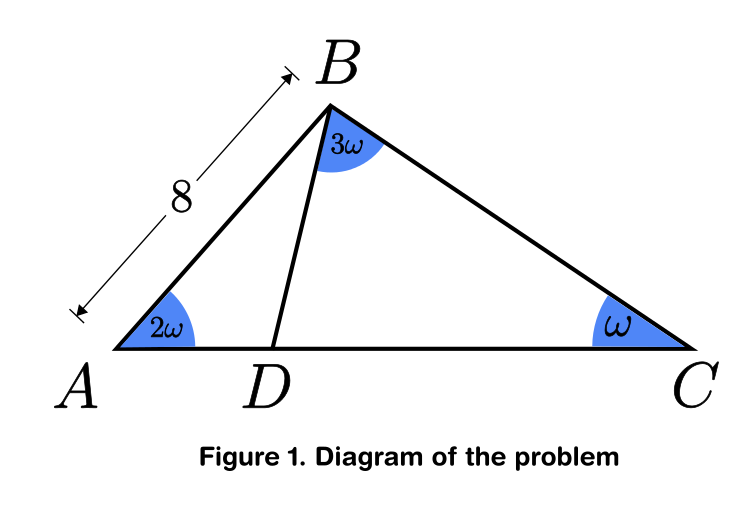 How to find the smallest length in a triangle when the angles aren't known? I am confused on how to find the answer for this problem. So far what I believe would apply is the triangle inequality but I'm not sure on how to use it. The figure $ABC$ is a triangle so as $BDC$. It is known that the length of $AB = 8$ inches and $\angle BAD = 2\,\angle BCD$ and $\angle\,DBC = 3 \angle BCD$. Find the smallest whole number that $BD$ can attain. So far the only thing I could come up with was to "guess" it might be $4$ since, $\angle BDA = 4\omega$ could it be that since $BD$ is opposing $2\omega$ hence that side might be $4$ inches. But that's how far I went. Needless to say that I'm unsure if that's a right way to go. I'd say minimum of 5"
BD is shortest when perpendicular to AC. thus 5 as per Skeeter. How does this equality becomes into an inequality? How does it imply this? So far I think that if they ask the smallest value for $BD$ then does it mean $\cos 2\omega$ should be close to $1$ so as when it is inserted in the equation it will not increase the factor of $4$ in the numerator. But from there I'm still lost. What am I missing?. Can you explain me more, please? I wonder how did you obtained 5.656? But yes it makes sense that it will be the smallest when perpendicular. It took me a while to find out where the isosceles triangle you were referring to is, but I found it. But from there I'm still stuck. Maybe can you offer an additional hint? Last edited by skipjack; March 23rd, 2019 at 07:46 AM. Find the smallest whole number that BD can attain. with BD perpendicular to AC. This results in w = 22.5 degrees. Looks like that was NOT the intent of your problem. WHAT really does "smallest whole number that BD can attain" mean? Is that a translation from another language? If about 5.6 were the smallest value, the smallest integer value would be 6. The smallest integer value for $|BD|$ is 5, as demonstrated in the diagram below.